In the mid 1970s my first Acupuncture teacher Doctor Hyun Huh originally explained the esoteric concept of unveiling the "Message" to me; noting that it was traditionally used for Clinical Diagnosis in ancient China, just before treatment. 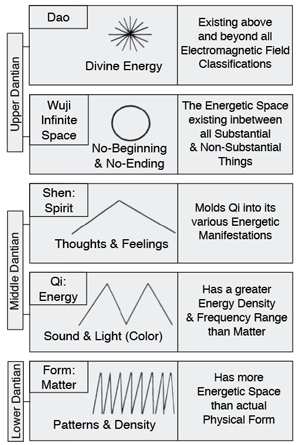 At first, he explained that the ancient Daoist concept for Wuji (Infinite Space) transforming into Taiji (i.e., Yin and Yang energies) set the basic foundation for Clinical Diagnosis; in that as Qi (Energy) begins to manifest and take form, it naturally transforms from one energetic state into another, unless it somehow becomes out of harmony (e.g., manifesting as an Excessive or Deficient energetic state). Therefore when energy begins to manifest within the relative universe of Yin and Yang, its "healthy" Yang nature appears as radiant light; which naturally dispels Yin turbid darkness. Doctor Huh then explained that when this Yang radiant energy manifests in a pure and tangible physical form, it appears as the "Divine Light" that is inherent within each one of us. This is why, when this radiant Yang light is internally cultivated, it manifests within the human body as an "Enlightened Being" (i.e., a "Saint" or "Immortal"). In the clinic, it is noted that both Yang and Yin energetic levels naturally exist within each individual's body; both on a pure level and a pathological level. Therefore when performing Clinical Diagnosis, these various Yin and Yang levels can be detected, read, and interpreted as Bio-Information or "Messages," which can be effectively read and interpreted by a doctor trained in Chinese Energetic Medicine. 1. Jing (Form or Tangible Matter): This energetic field is constructed of tightly condensed energetic particles, and has the least amount of encoded information contained within the various levels of its surface structure. Therefore, its energetic range manifests within a relatively short distance; and its energetic flow is easily obstructed. Although it contains the highest energetic density, it has the lowest energetic potential. 2. Qi (Sound and Light): This energetic field contains more encoded information than condensed matter; and has a higher energetic potential than all things that are vibrating at a Jing level. Because Qi acts as a moldable energetic medium that exists in-between the various realms of matter and spirit, it continually reacts to both thoughts and feelings. 3. Shen (Thoughts and Feelings): This energetic field contains even more encoded information than Qi. It is the focused intention of the Heart/Mind that molds Qi into its various energetic formations, both within the human body and without. Because it has the longest energetic range (i.e., Infinite), it manifests as an even higher energetic potential than Qi. 4. Wuji (Infinite Space): Because this is the infinite "space within space" existing within all energetic fields, it contains the potential of receiving even more encoded information than that of the Shen level. It naturally exists as a still, quiescent energetic field (or "net") that simultaneously envelops and embraces all substantial and non-substantial things. Therefore, all of our thoughts and energetic patterns emerge from the energetic potential maintained via the infinite space of the Wuji. 5. Dao (Divine Energy): This energetic field consists of the highest potential of all the energetic ranges. It possesses the most complete encoded information (or Message), and is the most powerful creative or destructive energetic field known to Man. Because the "Divine" is a supernatural influence that is exclusively above and beyond all electromagnetic field classifications, it is considered to be the final unification force of all physical, energetic and spiritual manifestations. 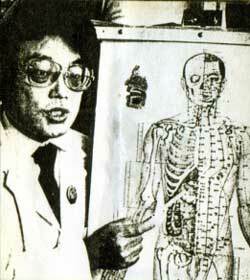 Doctor Li Fu Dong also explained that the body's cellular systems internally regulate themselves via communication through these same levels of encoded Messages; which are continually sent and received on a biochemical-electrical level. It is therefore through this unique system of energetic communication, that healthy cells are properly replicated. However, if the Message becomes "distorted," the misinformation will suddenly cause the cells to not become properly repaired. This can cause the damaged DNA to create copies of itself, onto newly formed cells. In this manner, each new cell also becomes damaged; and the continuously replicated mutations, can all give birth to various disease and cancer formations. For example, in the clinic, if a patient has an unhealthy emotional state that is dominated by such negative things as skepticism and other negative Thought Projections, they can adversely influence a Medical Qigong Doctor's ability to help someone heal. This is why whenever a true healing is performed, it is important that "non-believers" are not present to interfere with the doctor's projected healing energy. Non-believers can naturally create powerful Negative Thought Forms that can interfere with and even inhibit the doctor's energetic treatments. Likewise, individuals with a supportive frame of mind can create a powerful healing field, which can enhance and assist the doctor in his healing practice. In order to illustrate this fact, I will share with you a fascinating incident that took place at a Santa Cruz Bible College in the late 1980s. One morning, a friend of mine was practicing his "preaching" technique in an auditorium full of 250 young Seminary Students. Each Seminary Student was being observed by an Elder, who was currently grading their "Sermons" on Presentation, Delivery, and Content. Suddenly, the back door of the auditorium swung open, and a young Hispanic woman entered the room carrying a small baby boy. As she walked down the isle towards the stage, she was crying and pleading for help. She told my friend who was speaking on stage, that "God" had spoken to her in a dream, and had told her that if she came to that particular Bible College that morning and asked for help, that he would immediately heal her child of a serious diseased condition. My friend was both startled and alarmed. Not knowing what to do or even how to handle the situation, he quickly turned the meeting over to the Elder who was currently monitoring his Lecture. The Elder, seasoned in dealing with this type of interaction, calmly approached the young women and again asked her what the problem was. After again hearing her story a second time, he informed the distraught mother that, while God had not spoken to him directly about the situation, he would never-the-less be obedient to whatever God wished. Next, the Elder looked up towards the 249 young Seminary Students, who were currently sitting in the auditorium and watching the entire encounter, and loudly stated, "If anyone here does not believe that God can and will immediately heal this child, please get up and leave now." Within a few minutes, only three Seminary Students were left sitting inside the entire auditorium! The Elder then called the three remaining students to join him with my friend, who was currently still on stage. Then all five men stood together, and began to pray for the healing of the small baby; and the young child was instantly healed (a follow-up visit confirmed this fact)! Right after their prayer, the young mother thanked the five men and quickly left with her child, smiling. My friend who was originally preaching on stage at that time, was perplexed by the entire event; and turned to the Elder in order to inquire as to how he knew exactly what to do. The Elder smiled at him and then answered, "You have to understand that even Jesus, whom I consider to be one of the greatest healers of all times, could not perform healing in his own home town because of everyone's disbelief! Here in this auditorium, it would have been five of us who had the faith in healing, versus 246 who were skeptical and full of doubt! Therefore it is better to have a few people with strong unwavering faith, than to have many individual's filled with complete doubt or no faith at all."